Your deck once looked beautiful. But years of sun, rain, and snow have degraded its quality. 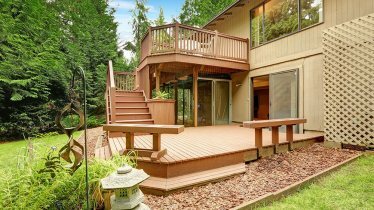 I have the skills and experience to restore your deck to its former glory. Refinishing a deck starts with a thorough inspection and cleaning. I look for any loose boards or structural problems – like rotting or split wood. Then, I power wash, sand, stain, and seal the entire deck from top to bottom. By the time I’m done, your neighbors will swear you built a brand new deck. I complete all projects on-time, within-budget, and with minimal disruption or mess. Deck refinishing is available throughout Southeastern Pennsylvania, including Chester County, Lancaster County, Delaware County, and Montgomery County. Request a quote today at (484)-319-5855. I’ll schedule an inspection at a time that works best for you.